Today, Arunaru would like to give you, our fine MangaGamer blog readers, an overview of the gameplay in Rance VI! 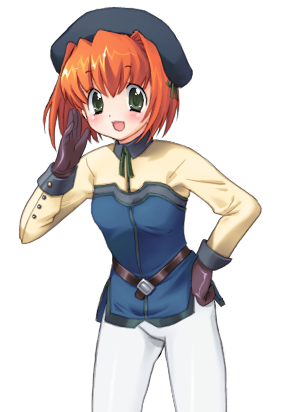 Hi there, are you excited for Rance VI to finally come out in English later this week? I sure am, I started working on this at the beginning of 2015. Remember 2015? That sure was a year that wasn’t 2016. Those were the days. But what our marketing team is insisting I write about for you today is the gameplay in Rance VI. If you’re going into this game (or 5D for that matter) having only played Sengoku Rance, you might be surprised to learn that the Rance games don’t have a consistent genre or mechanics, so neither of these games are any sort of strategy game. Rance 5D is its own insanity that I’m not talking about here, but Rance VI is a relatively traditional dungeon crawler RPG, albeit a very well done one. The director of the Rance series, TADA, was a fan of old dungeon crawlers like Wizardry, but recognized most of them weren’t actually all that good, so he wanted to make his ideal game in that genre. If you’ve ever played Etrian Odyssey or many of the older Shin Megami Tensei games or Wizardry or what have you, it’s fundamentally similar to those. 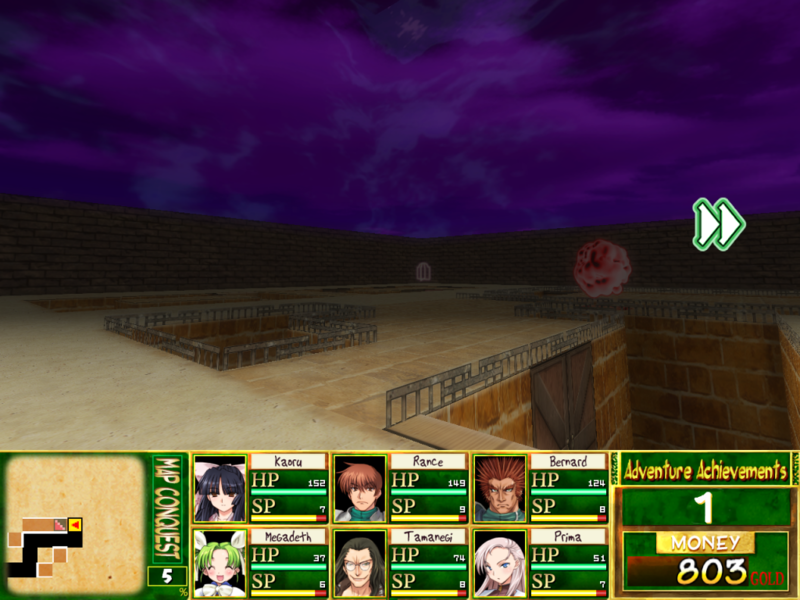 You navigate dungeons made out of squares with a first person view, where you’ll run into random battles with monsters. An effort was made to fill the maps in this game with unique elements so it doesn’t become tedious, so there are all kinds of weird things and different events and conversations between characters that can be found. Besides the stuff you can find sitting around in dungeons, winning fights adds points to your ‘Adventure Achievements’ you see in the bottom right there, which gets you items or money for every five points you get. You can bring a total of 16 party members into a dungeon and have 6 out for combat at a time. Every battle you get into costs a point of SP from each party member you have out, and when they run out of SP they become unusable, so there’s a natural limit on how long you can spend in a dungeon at once. Outside of dungeons, you’ve got a whole list of events that gets added to as the game moves along. Most events that do anything require spending those orbs you see in the top left corner, which you usually get by acquiring adventure achievements. So the general flow of the game is: Enter dungeon > Go until you finish your mission in the dungeon or your party runs out of SP > Check out events with whatever orbs you picked up. Besides having the effect of progressing your relationship with different characters (Half the time Rance does something that annoys them, but the game says it’s improving their friendship, so I guess it is), you can also power up your party members this way, so there is a gameplay benefit. 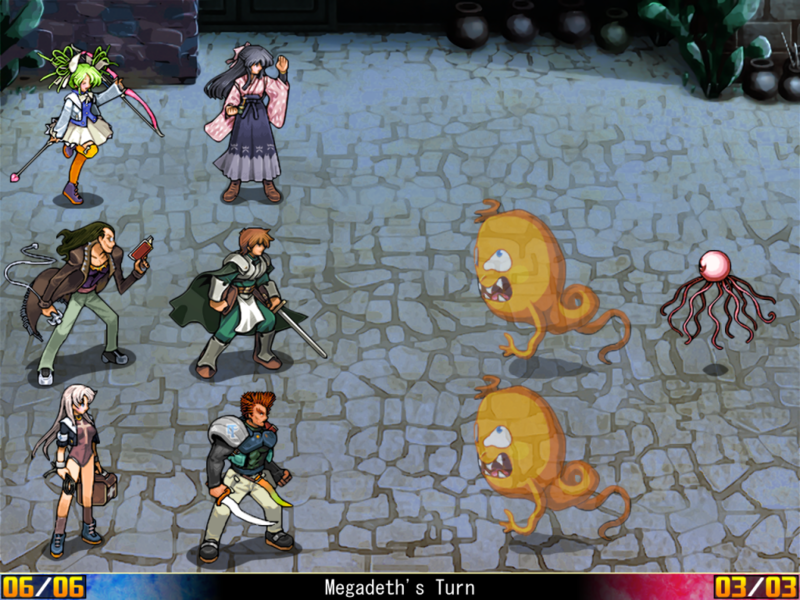 Battles are relatively straightforward RPG stuff, you’ve got a party of six people and you fight up to six enemies. There’s no MP or anything, so you can use any attack your party members have as many times as you want, but stronger moves generally have a charge time before they activate. The main limiting factor in the game is your SP, so you need to save your better, lower SP party members for harder battles. Also, unlike games like Etrian Odyssey, you’re using premade characters instead of making their own, so everyone has unique skills specialized to different jobs. Rance is the hard hitter, Sill can heal and use some offensive magic, but not as well as people who use offensive magic exclusively, and so on. And that’s more or less how Rance VI goes. Even if you know nothing about Rance or didn’t care for Sengoku Rance, if you’re into RPGs at all as I am, I highly recommend it. It’s personally one of my favorite RPGs of all time, both because it’s a solid RPG, and because the characters and plot are great and much more involved than Sengoku’s. Please tell all your friends and help make Rance VI the #1 Christmas gift of 2016, thanks. Rance VI + Rance 5D is currently up for pre-order! On sale December 23rd! Tagged alicesoft, Gameplay, rance 5d, Rance 6. Speaking as a first person dungeon crawler fan, Rance VI seems very unique in that it has substantial plot and characterization. Effort being put in so it’s not samey also seems interesting. In most first person dungeon crawlers, the joy mostly comes from filling up the mini map, collecting treasure, and finding the next set of stairs rather than trying to find all of the eccentricities of each individual floor. \i think that ”eccentricities of each individual floor” is a plus for that kind of game, The more stuff there is, more fun it is. Its a bit boring when you need to find only a few treasures and stairs to the next level. Guys in Rance’s team? Omg, the end of the world is coming! There’s a girl named Megadeth??? Thanks for the hard work. Sengoku Rance is what brought me to the visual novel world, and it could not be better to see its prequel. I appreciate the effort to bring us 3 games from Alice Soft in a reasonable short time window.